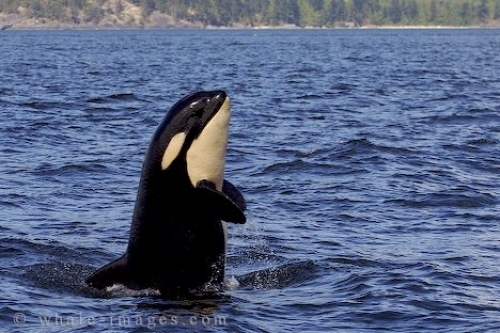 Baby Animal Pictures - Northern Resident Killer Whale, British Columbia. Spyhopping with half of its body out of the water, this young chap was taking a really good look around at its surroundings. Orca whales can see just as well above the water line as below, and they often spyhop like this baby animal pictures showing to get a better look at what's above the water. Baby animal pictures are great to see - especially one where the cute baby is mimicking the adult killer whales, but also because the young represent the survival of Killer Whale pods. Picture of a baby animal, a Orca Whale baby in Johnstone Strait off vancouver Island in British Columbia, Canada.